How to write Scholarship Appreciation Letter? Acquiring a scholarship is a matter of prestige, and proof of academic excellence and hard work. The objective of writing this letter is to appreciate that student who has studied hard to get a scholarship for his future studies. It is a moment of pride for parents also. The student feels great when he gets awarded with the scholarship. Winning scholarships shows that you are a class act, with academic credentials and extracurricular commitments deemed worthy of free college cash. The scholarship is a way of helping meritorious students who are not financially strong but are very sincere in their studies. It should be our responsibility to appreciate their efforts and hard work. The financial element of scholarships elevates its importance because it helps many those who have financial problems. The top management of a school or college offers the letter to the student to inform him that he/she passed the examination successfully and with good presentable grades. Your scholarship is the result of a generous contribution from a donor and it is vitally important that you take time to say thank you for such a gift. All his details of the education should be mentioned properly. It is about that he has received an opportunity to study further in scholarship. 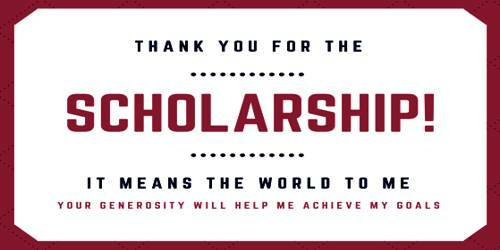 Scholarship sponsors or donors are very important philanthropists who help students attend college and follow their dreams. Also under the scholarship, everything starting from the exam to study material fees is included. The letter should be written in such a way that the student who got the scholarship feels motivated and encouraged. First and foremost it is vital to appreciate the student for his sheer hard work. You must mention in your letter that his efforts have only made him deserve the scholarship. The tone of the letter should carry warmth in your words and leave a personal impact in the reader’s mind. I am sure that your family is also feeling proud of you just like me. Students like you are a gem to our university. Once again, I congratulate you and wish you all the best for your future endeavors.